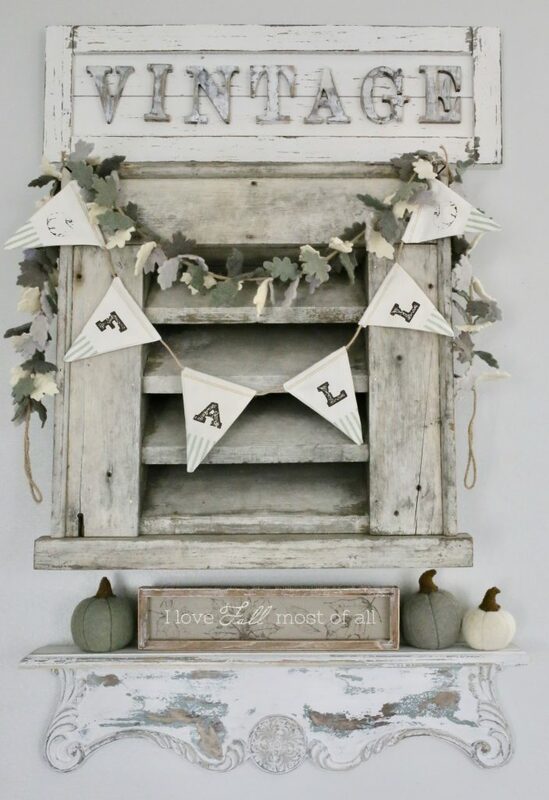 Welcome to the Fall Entryway Blog Hop! I have teamed up with some talented blogger friends to welcome fall into our homes and inspire you to create inviting spaces, too! At the end of the post, be sure to click on the links of my blogger friends to find more fall inspiration. If you are coming from Areeba’s home at Mint Candy Designs, welcome! 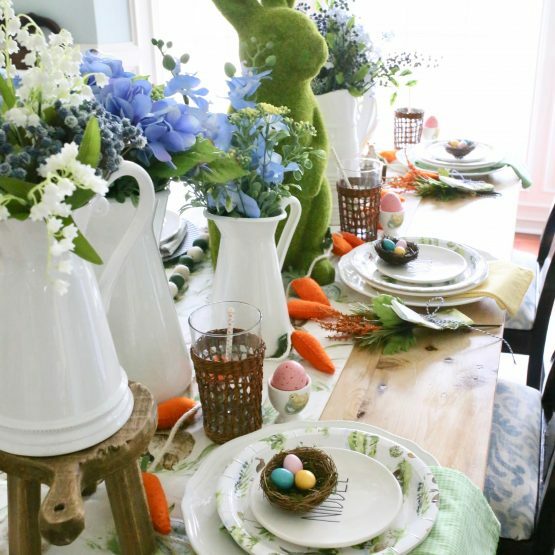 I love her simple, natural elements with cotton and pinecones! Create a welcoming Fall entryway to your home that invites the new season, as well as family and friends inside. Your entryway should be beautiful and inviting to all who enter from family members to guests. I recently decorated this area off our back entry and it has become one of my favorite spots. 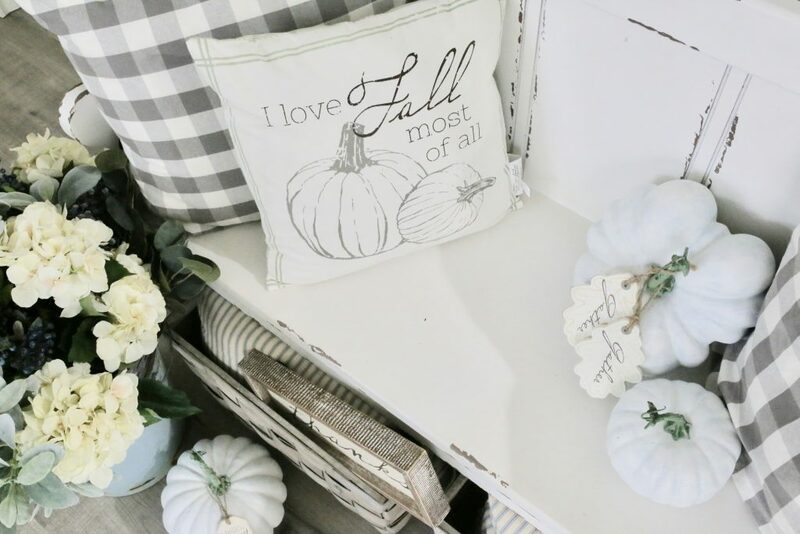 From vintage finds to new decor, let me show you what I did to transform this space for Fall. I often shop my home because, I love the challenge to use items in new ways and like a fresh look without getting all new decor. 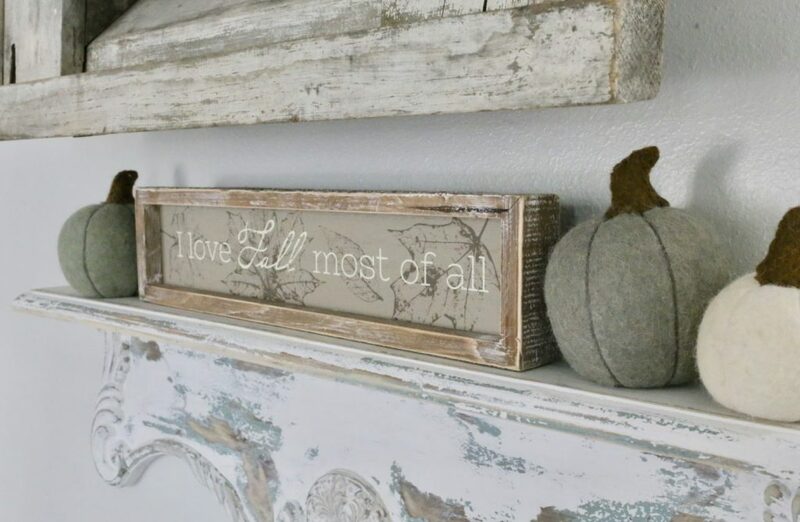 I previously had two signs above this shelf, but decided to hang them on my mantle for Fall! It does open up spaces to decorate so I pulled the barn vent from the guest bath to fill in here. What happened next is now my favorite view in my home… I placed the vintage sign above the barn vent (yep, I stole it from another wall, but it looks better here) and strung two banners on the old vent. I found this barn vent from Round Top Antique Show and it has been a favorite find. The fall show at Roundtop is October 1-6th, I will link the Roundtop Antique website here, for those interested! 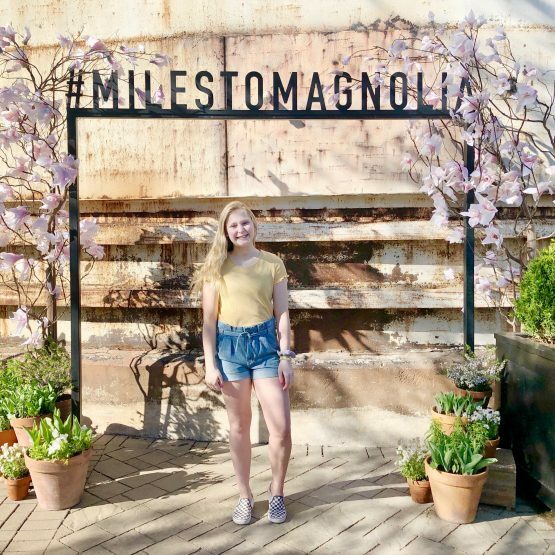 It is the best antique shoppin’ and junkin’ in Texas. I found the felt leaf banner and felt pumpkins from Marshalls. 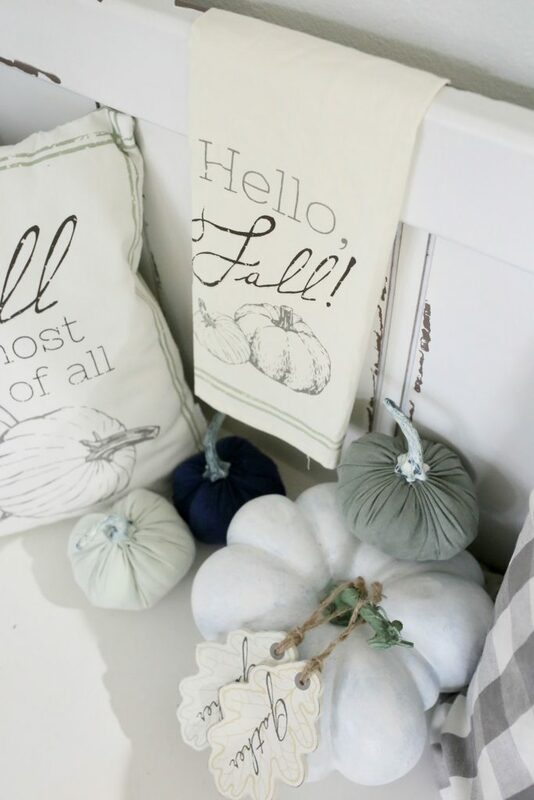 The ‘Fall’ banner is from Krumpet’s Home Decor. I just used some push pins to hold the banners in place. 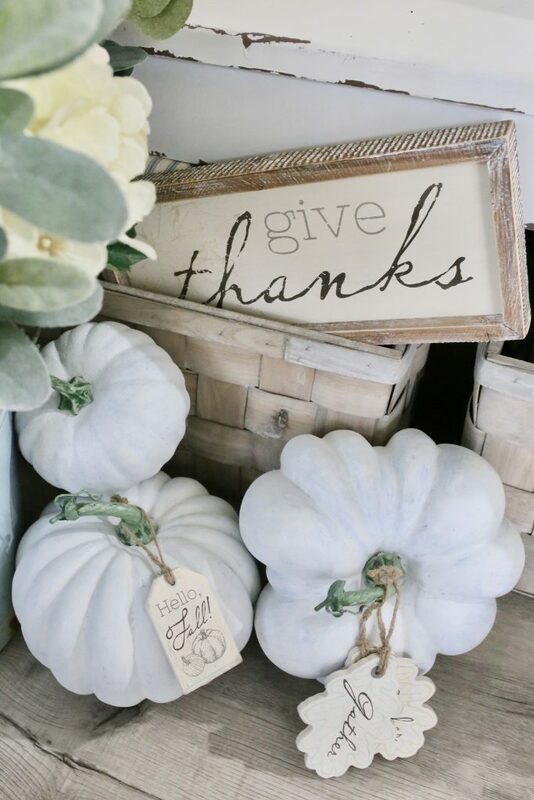 I love the seasonal and holiday line of decor from Krumpet’s because it is so easy to style together. The pillow, wooden tags, wood signs and tea towel are all from Krumpet’s. You can get 10 % off with code CUTERTUDOR at Krumpet’s. The colors that I am using for fall decor are the same that I use in my home; mostly neutral with hints of sage green and blue. The shelf was originally blue, but I chose to paint it white and distress it. I placed a small sign and three felt pumpkins on the shelf. I guess good things do come in sets of three! I just love the mix of old and new, chippy distressed and weathered. On the other wall, I have a chippy old gate from an antique shop in Waco, Texas. I often layer wreaths, signs or prints on the gate depending on the season. For Fall, I hung a wreath from Michael’s craft store; I found it last year. Layering decor just adds more texture, and interest, and is a technique I use often whether it be wall decor or tablescapes. I had been looking for a bench for this area for sometime, old or new, and found this one that was the perfect size at Kirkland’s last year. It is still in stock. I have baskets to store extra pillows underneath the bench. 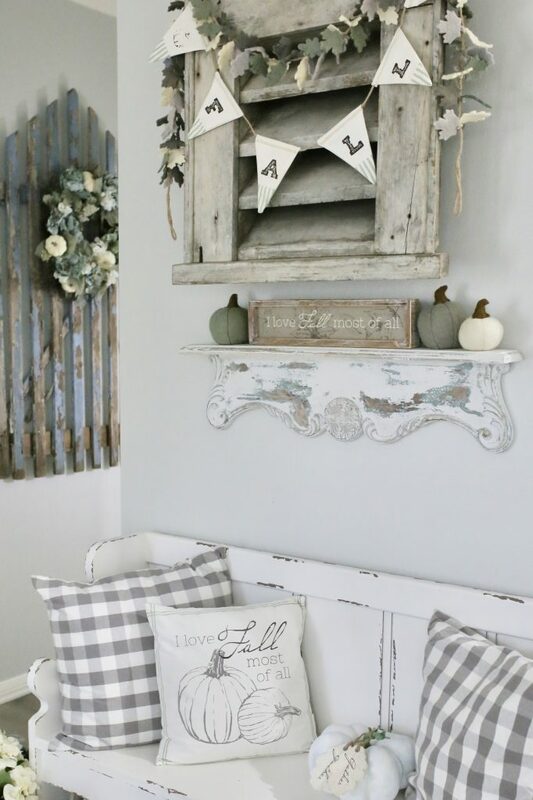 If you have extra pillows, and they match the decor in the room, just store them in baskets or old crates instead of hiding them in a closet. 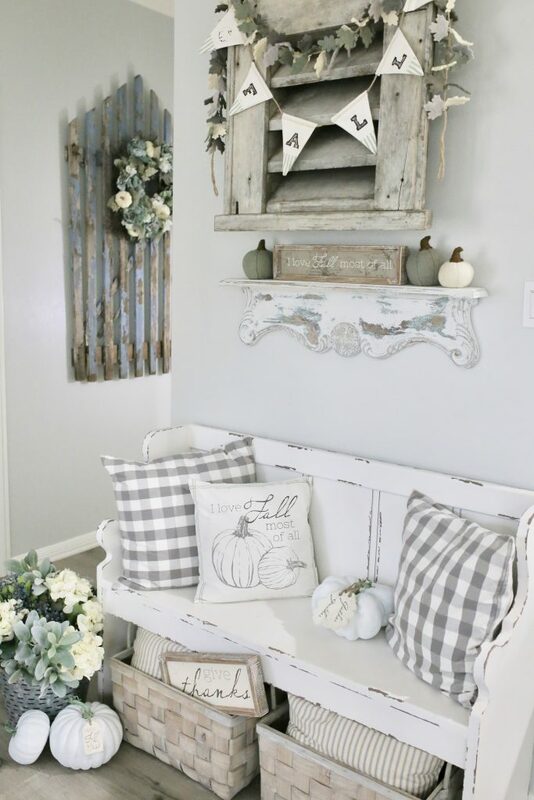 For fall, I like to use these checkered pillows on the bench, which I rotate to my guest room bedroom in spring to play off the floral patterned bedding. Again, I like to repurpose my decor! 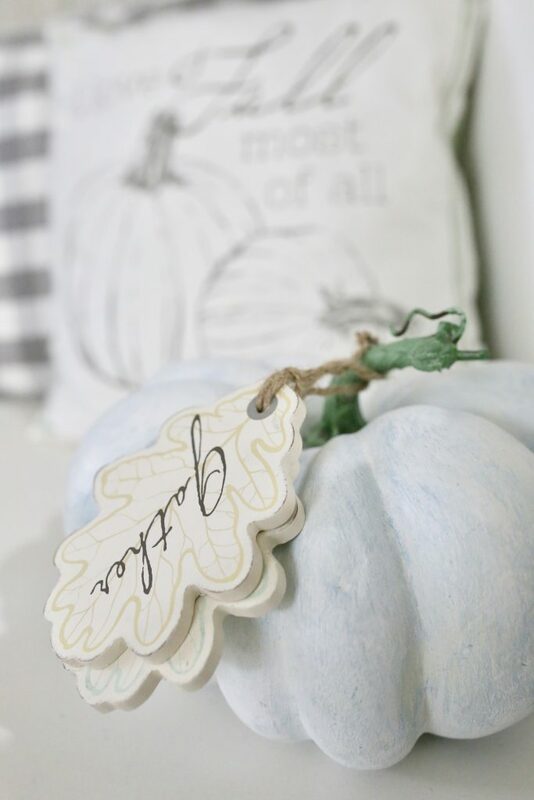 The fall inspired pillow is from Krumpet’s Home Decor, as well as the signs and wooden tags. 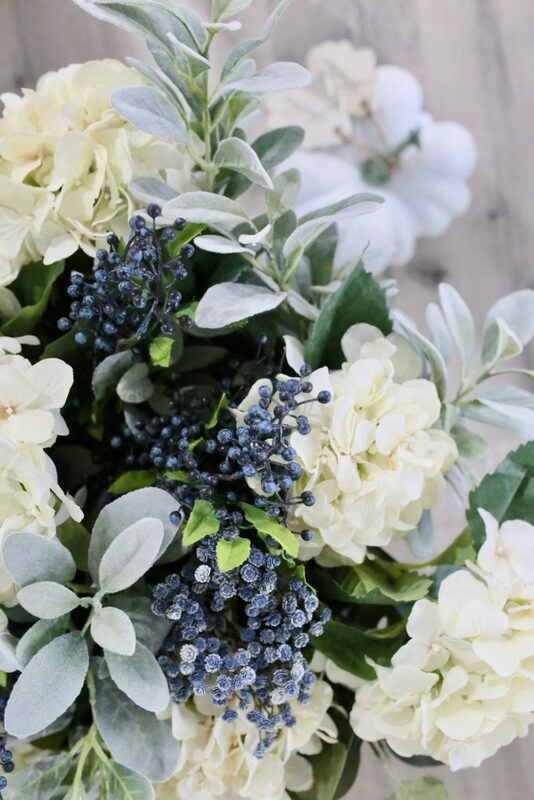 To make the summer flowers (hydrangeas and lambs ear) appear more like fall, I added a some eucalyptus and navy blue berry stems. 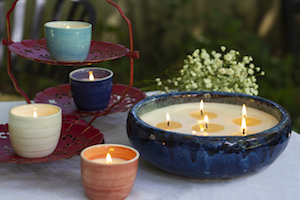 Some greenery easily transitions to fall, like magnolia leaves or eucalyptus and these work for many seasons. I think if you want to use green in your fall stems, then do it! I believe that you should do what you like, even if it isn’t going to be the most popular or considered trendy. Maybe if I lived in Vermont and saw more of seasonal colors change in the fall, I would be more likely to stick with oranges and yellows for Fall. However, I tend to lean toward cool colors no matter what the season, so maybe not. 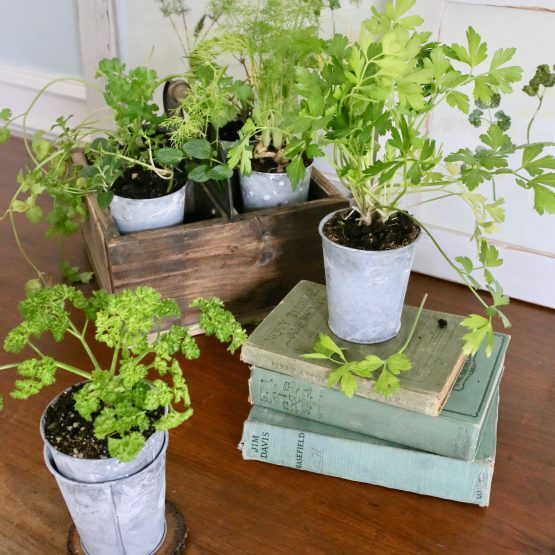 I placed the stems in a vintage blue enamel bucket. It just adds a little character to this room. Again, group pumpkins in three! The pumpkins were originally orange, but I chalked painted them blue then white. Using two or more colors of paint just adds dimension and more authenticity. There is a inexpensive brand of chalk paint for crafts at Joann’s and Michael’s which works great for small projects. I love neutral decor mixed with blues and greens. I love the soft sage greens, navy blue and aqua colors best. 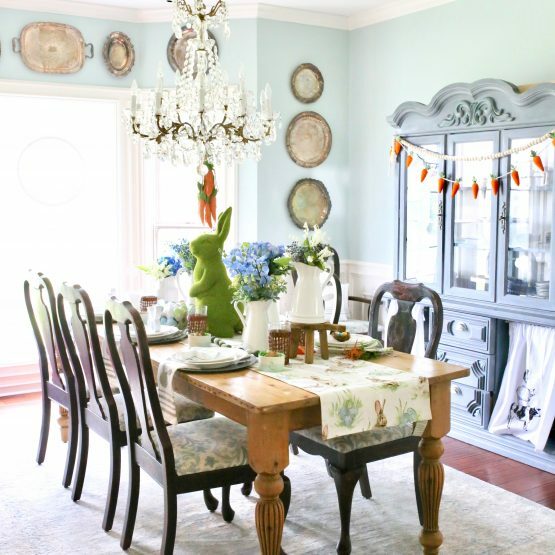 Now that you have seen my entry way, be sure to take a tour on the blog hop. Next stop is my friend Sandra at Charmed Crown Blog! 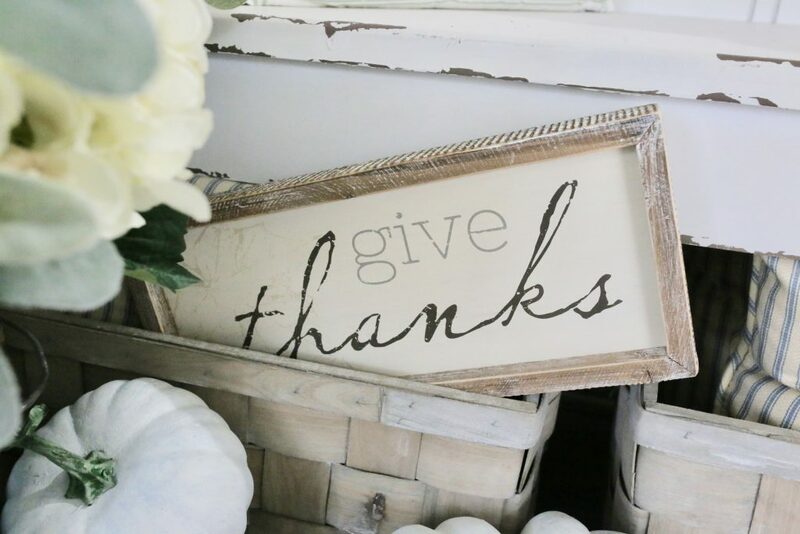 My blogger friends will surely inspire you with their beautiful homes and living spaces for fall! 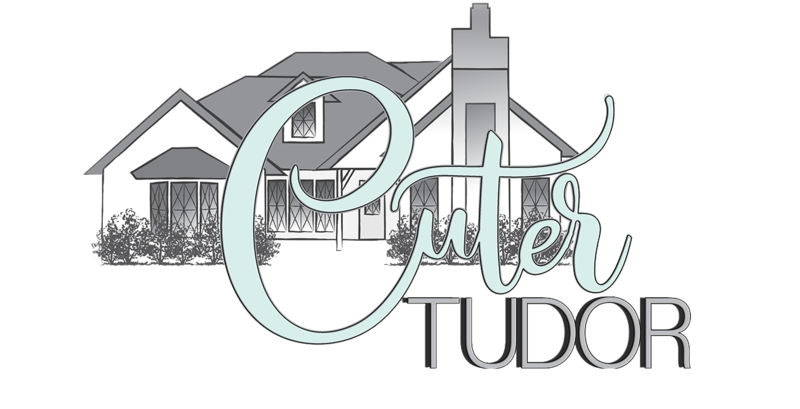 Thank you for stopping by the Cuter Tudor. I hope you enjoy the rest of the Fall tour! If you like what you see, pin the photo for later on your Pinterest board or join me over on Instagram @cutertudor for more daily decor inspiration! Happy Fall, y’all! Amy everything is just stunning! 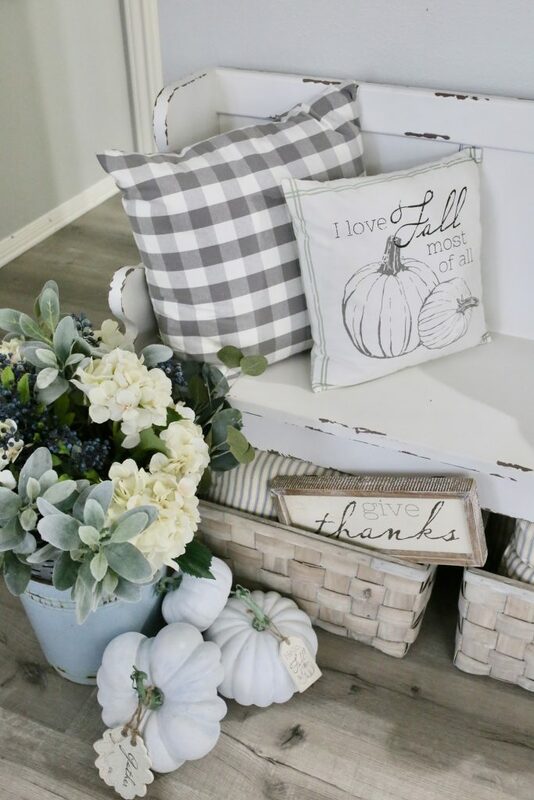 I love the neutral fall decor with the right amounts of chippy. So beautiful! Thank you Areeba! Its always fun to see everyone’s style in similar spaces. Bree, you are the sweetest! I am so happy to be blog hopping with you too. Such a beautiful space! I love how bright and fresh it is while still feeling cozy at the same time! Neutrals are always my fav! Thank you Amanda! Neutrals with cool colors are always my favorite! So fun to join you on this blog hop. Amy. Every detail. You are seriously the detail master. 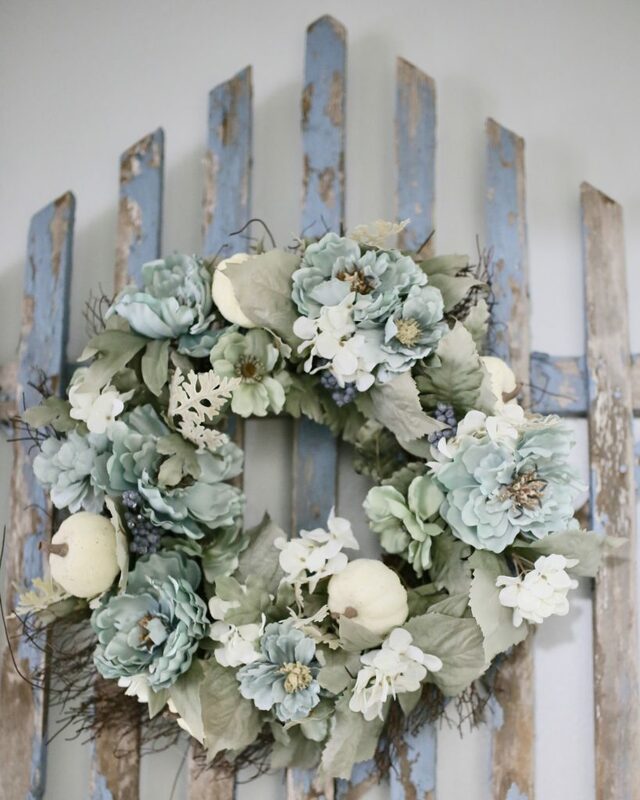 I love every fall touch and I love the way you used the muted greenery and neutral colors with it. You inspire me friend!